The menisci of the knee joint are two pads of cartilaginous tissue to disperse friction between femur and tibia, and act as shock absorbers. 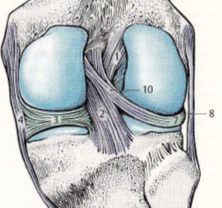 The medial meniscus (3) has a half moon form, is on the posterior side (6) wider than anterior (5) and is on the medial side grown together with the medial collateral ligament (4). It is much less flexible as the lateral meniscus and therefore much more prone for injuries. 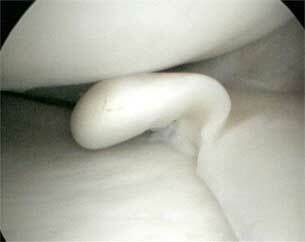 The lateral meniscus (7) has a circle form, the insertions are close to each other, and it has the same width everywhere. It is not grown together with the lateral collateral ligament (8) and is therefore more flexible and less prone for injuries. Tears of the meniscal cartilages are common. Tears often occur through sports injuries, such as bad tackles or falls, or awkward twisting on a bend knee. As people get older, the menisci become worn and begin to lose their elasticity, and degenerate meniscal tears can occur with just minor trauma, or sometimes even spontaneously. The menisci have a very poor blood supply, and therefore most tears will not actually heal up on their on. 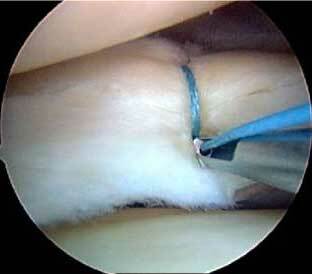 The appropriate treatment of choice is arthroscopy. 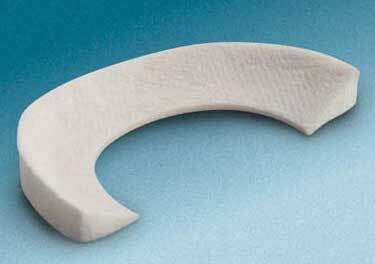 Only about 15 to 25% of meniscus cartilage tears are actually surgically repairable. This percentage goes down, the longer the gap is between the injury and the actual arthroscopy. meniscus tissue cannot be repaired, as it can be like trying to stitch wet tissue paper – the stitches will not hold and the tissue will not heal. MRI scans are very poor at predicting which tear might actually be appropriate for repair vs. trimming. Therefore, whether to repair or trim a cartilage is a decision that can only really be taken at the time of the operation, during the surgery. This is why the options, the pros and cons and the consequences all need to be discussed carefully preoperatively. If a meniscus tear is repairable, then the tissue is normally stitched back together using tiny little specialised sutures via arthroscopy. A very large proportion of patients who have meniscus tears are not suitable for surgical repair. In these patients, the tissue simply has to be trimmed back to a smooth stable rim. The short-term results are good, with fairly rapid resolution of symptoms and return to activities. However, the menisci are important shock absorbers and load sharers in the knee, and loss of a meniscus increase the forces across the knee joint, increasing wear and tear. Loss of a meniscus increases the risk of developing arthritis in the knee in the future. The more meniscus tissue is lost, the bigger that risk. In most cases it will take many years for arthritis to develop in a knee and for it to cause symptoms such as pain, swelling and stiffness. However, there have been well-documented cases of some patients developing quite rapid onset of severe arthritis in the knee after removal of a meniscus – particularly for the lateral meniscus, and especially in young high-level athletes. For those patients who have lost significant amounts of meniscus tissue, but in whom there has not been complete loss and the outer rim is still intact, there is now a new surgical option that has very recently become available to patients. The Menaflex collagen meniscus implant is a scaffold made from collagen, which is a natural substance made of numerous fibres and bundles, and which is the major constituent of normal meniscus tissue. The implant is highly porous and acts as a scaffold, allowing a patient’s cells to grow into it, so that the missing meniscus tissue regrows. If the whole meniscus has been lost, then the only real option at present is to perform meniscus allograft transplantation. This is a procedure where the missing meniscus is replaced with donor tissue, which is screened and sterilised much in the same way as other donor tissues such as for kidney transplants. The difference, however, with meniscus transplants is that the cells within the cartilage tissue are embedded in a thick and relatively impenetrable elastic tissue, which means that the patient’s immune cells do not react to the new donor tissue. This means that meniscus allograft can be transplanted into patients knees without the need for nasty immunosuppressive drugs, and with no significant risk of rejection. The possibility of using genetic engineering to regrow one’s own damaged meniscus tissue in-situ is still a long way off, but genuine and exciting progress in the area of meniscus surgery is being made, and the axiom of ‘meniscus preservation where possible, meniscus replacement where indicated most certainly holds true.